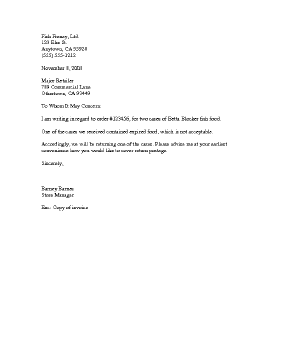 A customizable letter template in which a customer or client formally requests permission to return merchandise. I am writing in regard to order #123456, for two cases of Betta Blocker fish food. One of the cases we received contained expired food, which is not acceptable. Accordingly, we will be returning one of the cases. Please advise me at your earliest convenience how you would like to cover return postage.